Heat oven to 400F. Grease 30 cups of 2 mini muffin tins. Set aside. Melt the butter in a medium skillet over medium heat. Allow to cook, stirring occasionally, until the butter turns an amber color and smells nutty. Remove from the heat and pour the butter into a heatproof bowl. Set aside. In a large bowl, whisk together the all purpose flour, almond flour, sugar, and salt. Whisk in the egg whites until well combined. Stir in the bourbon and butter. Let stand for 20 minutes. 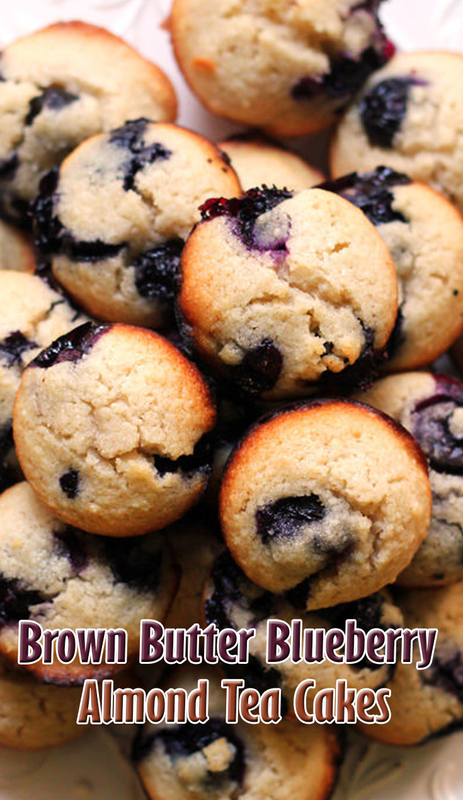 Fold the blueberries into the batter and, using a small cookie scoop, scoop into the prepared muffin tin. Bake until a tester comes out clean, about 12 to 15 minutes. Let cool in pans for 10 minutes before removing to a wire rack to cool completely.